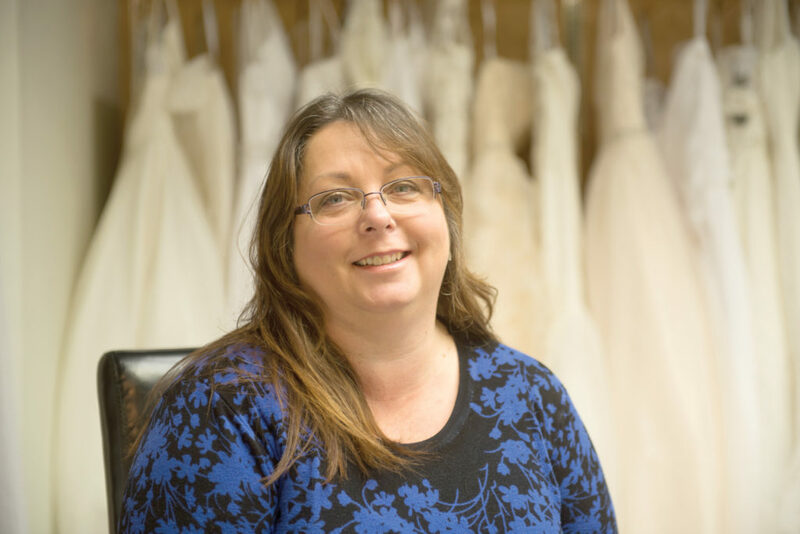 February’s feature personality is a relative newcomer to Williams Lake but has made a huge splash in the local wedding industry. Kim Futcher was born in Abbottsford and her family started moving around between Fraser Lake, Vanderhoof and Prince George from age 5 to 12. At 12 they moved to 150 Mile house where Kim finished high school. After school Kim moved to Vanderhoof and worked at a guest lodge north of Anahim Lake for the next 20 years where she flew in for her shifts. Wanting a change in pace Kim enrolled in an applied business technology course at the College of New Caledonia in Vanderhoof. Kim graduated with her diploma on a Friday and was working in her new profession three days later. For the next two years she worked for a company called Avison Management Services as an accounts payable and payroll manager. She then moved over to a First Nations Health organization and worked organizing medical travel for clients for two and a half years. In 2013 Kim and her husband Kevin moved to Williams Lake and Kim started working at Better at Home as a program coordinator. A couple years before their move Kim started an online business for used wedding and prom gowns. Things were doing well so Kim took the next step and opened a retail outlet in Vanderhoof selling consignment gowns. Once they made the move to Williams Lake Kim opened another store this time she was selling new product instead of used and consignment. Her new store “Brides and Belles” was born in 2014 in the Delainey Centre Mall but she soon outgrew that space and moved into her present location on Oliver street in the old Walts Mens Wear building. Kims business has grown in leaps and bounds and have now expanded into prom, mother of the bride, flower girl and bridesmaids’ dresses catering to all sizes. As well you will now find in her store hair accessories, veils and suit and tuxedo rentals. Kim has also expanded her staff from just herself to two staff members. After participating in a few bridal shows Kim found that there was a need for an event that was a little more targeted, so she decided to create her own and this year will be the 2nd annual Bridal extravaganza. She is picky about who exhibits and although this year won’t have a fashion show all her gowns will be on view at the show which this year is being held at TRU. When shes not running her business or working at Better at Home she volunteers at the Cancer Society, the Seniors Activity Centre and is part of the Hospital Trust Society. She loves to travel and has a passion for training dogs working with a German Sheppard right now. The future looks bright for this local entrepreneur and if you are lucky enough to be a part of a wedding this summer give her a visit.